Annie Dookhan, the state chemist at the center of the scandal. The state’s public defender agency estimates it could need up to $332 million to represent thousands of people who faced criminal penalties or civil sanctions based on evidence potentially tainted at the now-closed state drug laboratory in Jamaica Plain. The Committee for Public Counsel Services developed the budget projection as it seeks money from the Patrick administration to deal with the fallout from the drug lab scandal linked to chemist Annie Dookhan, who allegedly told State Police she falsified results. The scale of the scandal came into sharper focus Tuesday when the attorney leading a state investigation into the drug lab, ordered by Governor Deval Patrick, provided the latest figures on how many people might be affected. Boston attorney David Meier said his team has identified at least 10,000 people so far who were prosecuted based on drug testing conducted by Dookhan during the nine years she worked at the Department of Public Health lab. Meier stressed that even more people could be affected because his team has not completed its inquiry into prosecutions in the district court and the Boston Municipal Court system, where most drug cases are prosecuted in the state’s criminal justice system. A two-page budget proposal from the public defender agency, obtained by the Globe, sketches out an even direr scenario. The Committee for Public Counsel Services concludes that it needs $12.5 million right now to deal with Dookhan-related litigation and that it will need $62.5 million to deal with the estimated 35,000 criminal cases in which Dookhan played a role in testing seized substances that were suspected of being contraband. But the public defender agency projects it could need as much as $332 million because the allegations against Dookhan could call into question every drug test performed at the Department of Public Health lab, regardless of whether Dookhan was directly involved. Lisa Hewitt, general counsel for the agency, said the $332 million is an estimate that assumes each of the 190,000 cases handled at the lab since 2003 would have to be litigated and that an attorney would have to be assigned to represent each defendant. Hewitt said many of the cases could be resolved if prosecutors chose to dismiss the charges. Hewitt said the estimate includes money to pay private attorneys to handle cases, hire translators and investigators, and train lawyers in navigating the complex legal questions raised by the unprecedented scandal. Hewitt said the public defender agency, when required by law, will represent indigent clients in probate and family court, where they have lost, or may lose, parental rights because of what may be declared unlawful convictions. Spending on those cases would be in addition to the $332 million, she said. “There are a lot of really, really massive problems with this situation,’’ Hewitt said. Also Tuesday, Cape and Islands District Attorney Michael O’Keefe, the incoming president of the Massachusetts District Attorneys Association, said prosecutors have finalized their budget request and believe they need $12.7 million for more prosecutors, support staff, and in some cases, office space and computers, for all Dookhan-related cases. O’Keefe declined to comment on the request from the public defender agency. He said prosecutors may need more money, depending on what ongoing investigations unearth. Suffolk District Attorney Daniel F. Conley’s office said Tuesday that 110 imprisoned defendants convicted in drug cases involving Dookhan have had their sentences put on hold in Suffolk Superior Court. About 40 defendants being prosecuted in the Boston Municipal Court system have also had sentences put on hold. Meier, the attorney leading the Patrick-initiated investigation of the scandal, said the governor expanded Meier’s duties Tuesday to include a hand search of the case files prepared by Dookhan when she worked at the lab. Meier’s team has been reviewing databases provided by the State Police, Department of Public Health, state’s courts, state prosecutors, and public defender agency. But that data has errors in it, and now the governor wants Meier’s team to study the actual paperwork that underlies the databases. “I like to refer to it as a file-by-file review of every file at the Jamaica Plain laboratory, with the object being we should leave no file unturned to determine which files, which cases, and most important, which defendants Miss Dookhan may have touched,’’ Meier said. Meier’s inquiry will be conducted in parallel with an investigation into the drug lab led by Inspector General Glenn Cunha and alongside Attorney General Martha Coakley, whose office is conducting a criminal investigation that has led to obstruction of justice charges against Dookhan. 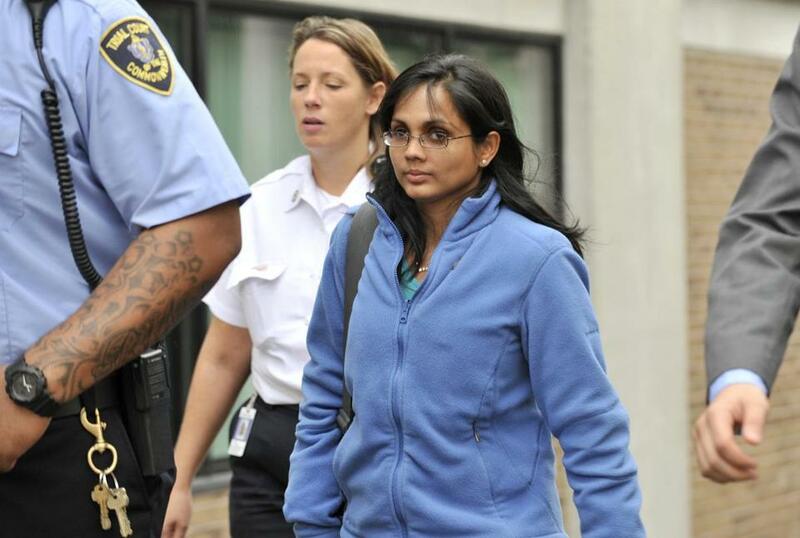 Dookhan, who lives in Franklin, has pleaded not guilty in Boston Municipal Court to two counts of obstruction of justice and to an accusation she falsified her academic credentials. She remains free pending trial. In court papers, Coakley’s office said it expects a grand jury investigating the drug lab to return indictments against Dookhan before her next scheduled court date, Dec. 20, in Boston Municipal Court. The Patrick administration has asked lawmakers for $30 million to pay for Dookhanrelated costs between now and February that are incurred by county prosecutors, the court system, local governments, the public defender agency, and social services agencies. The administration has said it is open to seeking more money once more is learned about the damage to the criminal justice system that can be linked to Dookhan and the state lab.